Providing free wi-fi and free private parking next to an artificial lake, hotel restaurant dreri offers air-conditioned rooms with flat-screen tvs and minibars, while its gastronomical offer includes albanian, ... Lexo detajet.. Located near the city center of tirana, select hotel includes a traditional restaurant and offers free wi-fi access in all areas. the central skanderbeg square can be reached in 1.3 km. all accommodation un... Lexo detajet..
Set in tirana, hotel vila bregu provides air-conditioned rooms with free wifi. the property is situated 2.3 km from skanderbeg square. rooms are fitted with a patio with views of the garden. all units in th... Lexo detajet..
Set within 1 km from the central skanderbeg square, hotel town house has a restaurant and features air-conditioned rooms with 32 inch flat-screen tvs and free wi-fi. 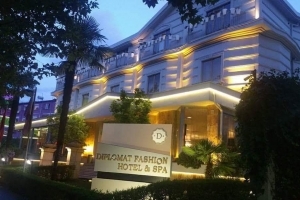 renovated in 2013, the hotel features a comm... Lexo detajet..
Hotel deluxe is set in tirana, 2.6 km from skenderberg square. the 4-star hotel has air-conditioned rooms with a private bathroom and free wifi. the property has a restaurant and a garden. sky tower is 2.5 km a... Lexo detajet.. Opened in 2012, the stylish capital tirana hotel is situated in the old town next to the general prosecution office. it offers elegant rooms with soundproofed windows, cable and satellite programmes, air condit... Lexo detajet..
Dinasty residence is located in the centre of tirana and features a lavishly decorated restaurant and a bar with summer terrace. free private parking is also available. all rooms at dinasty residence includ... Lexo detajet.. 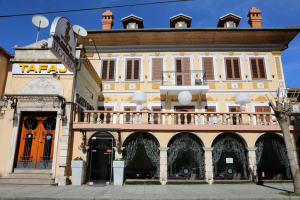 The family-run hotel baron, is located 3 km from tirana center, in a quiet green area away from city noises. it offers an on-site restaurant and free wifi available throughout the property. all rooms come w... Lexo detajet.. Located within 1.4 km of skanderbeg square in tirana, foresteria offers accommodation with free wifi. all units include a private bathroom and have air conditioning, a flat-screen tv and a fridge. dajti... Lexo detajet.. Featuring a restaurant and swimming pool, privilege hotel dhe spa offers air-conditioned accommodation 5 km from the centre of tirana. guests can have a drink at the on-site bar. free wifi access is provided in... Lexo detajet..
Set in tirana and within 3.5 km of skanderbeg square, hotel arberia features a terrace, non-smoking rooms, and free wifi. built in 2003, the property is within 6 km of dajti express and 2.4 km of sky tower. gue... Lexo detajet.. Located 500 m from the centre of tiranë, bdheb tirana smile offers air-conditioned rooms with flat-screen satellite tv and free wi-fi. skenderberg square is 10-minute walk away. free on-site parking is provide... Lexo detajet..
Hotel viviana is located in korçë. all rooms feature a flat-screen tv with cable channels and a private bathroom. the accommodation provides free wifi. at the hotel, the rooms are equipped with a wardrobe... Lexo detajet.. Located in the famous blloku neighbourhood of tirana, la bohème hotel offers an a la carte restaurant, a spa and wellness and a fitness centre. the rooms are modernly furnished and free wi-fi access is provide... Lexo detajet.. Featuring free wifi, centrume hotel is set in the centre of tirana, just 300 m from the skanderbeg square. it offers air-conditioned rooms and a garden with a seating area. all rooms comprise an lcd tv with... Lexo detajet.. Surrounded with a lush garden, this property is located in the centre of tirana, about 1 km from skanderberg square. free wifi is available throughout the property and free private parking is available on site.... Lexo detajet..
Offering an outdoor heated pool with a sun terrace, hotel l. a. s. is located 500 m away from the big park in tiranë and offers air-conditioned accommodation with free wifi. meeting facilities and a lush palm-... Lexo detajet.. Situated in tirana, within 1.3 km of skanderbeg square and 6 km of dajti express, eler hotel offers accommodation with a terrace and a shared lounge, and free wifi. featuring a bar, the hotel is close to severa... Lexo detajet.. Featuring a terrace, korca city rooms is set in a historical building, centrally in korçë. all rooms boast a flat-screen tv with cable channels and a private bathroom. guests can enjoy city views. at the ... Lexo detajet..
Boasting a garden, bar, shared lounge and free wifi, buna park hotel is located in shkodër, 2.2 km from rozafa castle shkodra and 2.5 km from lake skadar. featuring a 24-hour front desk, this property also wel... Lexo detajet..
Hotel unik in pogradec has 3-star accommodation with a bar. the 3-star hotel has air-conditioned rooms with a private bathroom and free wifi. guests can enjoy city views. at the hotel, the rooms come with a... Lexo detajet..
Hotel nature in kolonjë features a garden and a bar. with free wifi, this 3-star hotel offers a 24-hour front desk. guests can enjoy mountain views. at the hotel, every room has a desk. at hotel nature, th... Lexo detajet.. Diplomat hotel dhe spa elegant and luxurious, is a boutique hotel in tirana outlining the details that turn your stay into a unique and complete experience. with a harmonious location between the tirana city ce... Lexo detajet..
Hotele shqiptare me sherbime cilesore si dhe hotele me ambjente relaksuese. ketu do te gjeni hotele ne tirane te lira si dhe hotele shqiptare, explore albania holidays and discover the best time and places to visit. .